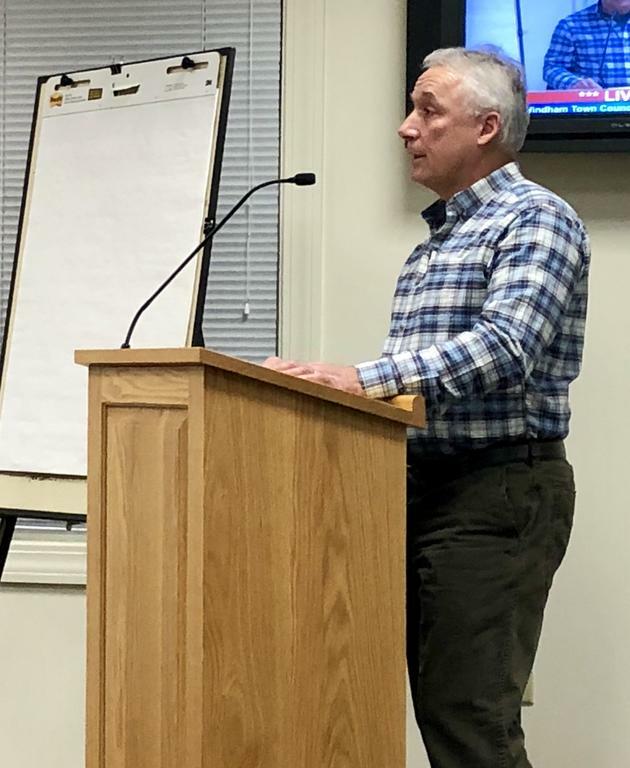 WINDHAM — After months of concerns about over-development, the Town Council Tuesday unanimously approved “minor modifications” to cluster subdivision standards and scheduled a public hearing on a proposed moratorium on development in the farm zone. Cluster subdivisions permit a reduction in lot size in exchange for half of the available property being preserved as open space. The amendments to the standards remove the density bonus, which allow for more houses on a lot if the open space is made available for public use. The changes also allow a subdivider to retain ownership of the open space “to continue to use it for agriculture or forestry uses,” according to Town Planner Amanda Lessard. Before the amendments, the open space could only be owned by the town, a land trust or a homeowners association and used only for conservation or recreation purposes. With the new changes, if the subdivider later wishes to sell the land, it may only be sold to the town, land trust or homeowners association, and it will have “a conservation easement on it in perpetuity so it could not be developed,” Lessard said. Development in Windham has been a topic of discussion for months. At the Sept. 25 meeting, the Town Council approved a work plan for the Long Range Planning Committee that includes investigating zoning ordinance and map amendments and impact fee recommendations. Residents packed the Oct. 22 Planning Board meeting to voice their concerns about over-development, including impacts on taxes, schools, roads, water bodies and the town’s rural character. Ken Grondin of Grondin Corporation spoke against the amendments at the Jan. 15 meeting this week, saying they would take rights away from the farm community. “That would be putting in jeopardy what they can and cannot do with their land. It’s really taking rights away from people,” he said. Other councilors spoke about more changes they’d like to see. Councilor Timothy Nangle would like to redesign the standards for cluster subdivisions to make them look more rural. Councilor David Nadeau supported creating buffers of trees between roads and developments. The council scheduled a public hearing on a proposed moratorium on development in the farm zone for Jan. 29. Councilors also discussed retail medical marijuana establishments after resident Ron Giroux said during the public comment session that a medical marijuana store recently moved to his residential street. “We don’t want this business two doors down from our home. There is a bus stop directly in front of the marijuana store. This mistake can and must be corrected for the sake of our children,” he said. Councilor Rebecca Cummings urged the public to reach out to their local representatives who make statewide policy. “You have no bigger ally than me,” she added. Councilors Nangle and Maxfield emphasized the lack of control municipalities have in terms of regulating marijuana use. Rules are passed down by the state, and some laws have not yet been finalized, leading to uncertainty. “The town, and every town in Maine right now, is dealing with the Wild West of a brand new market,” Maxfield said. The council recently created a Retail Medical and Adult-Use Marijuana Establishments Task Force to review state laws as well as Windham’s zoning map regarding marijuana establishments and make recommendations to the council. Ken Grondin of RJ Grondin & Sons spoke during the public hearing Tuesday night.